On March 26, 1676 during King Philip's War, Captain Michael Pierce led approximately 60 Plymouth Colony colonial troops and 20 Wampanoag Christian Indians in pursuit of Narragansett Indians who had burned several Rhode Island towns and attacked Plymouth, Mass. as part of King Philip's War. Pierce's troops caught up with the Narragansett Indians but were ambushed in what is now Central Falls, Rhode Island. Pierce's troops fought the Narragansetts for several hours, but were surrounded by a larger force of Narragansetts. The battle was one of the biggest defeats of colonial troops during King Philip's War with nearly all killed in the battle, including Captain Pierce and the Christian Indians ("Praying Indians") (exact numbers vary by account somewhat). The Narragansetts lost only a handful of warriors. Nine of the colonists who were among the dead were first taken prisoner (along with a tenth man who survived). These men were purportedly tortured to death by the Narragansetts at a site in Cumberland, Rhode Island, currently on the Cumberland Monastery and Library property. 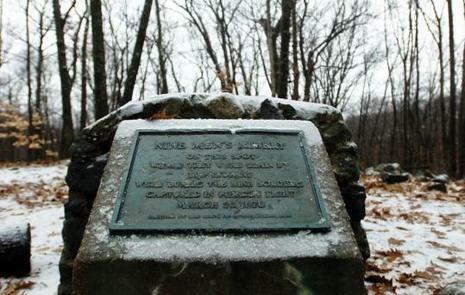 The nine dead colonists were buried by English soldiers who found the corpses and buried them in 1676. The soldiers created a pile of stones to memorialize the colonists. This pile is believed to be the oldest veterans' memorial in the United States, and a cairn of stones has continuously marked the site since 1676. The "Nine Men's Misery" site was disturbed in 1790 by medical students led by one Dr. Bowen looking for the body of one of the dead colonists, Benjamin Bucklin, who was said to be unusually large with a double row of teeth. They were stopped by outraged locals. The site was desecrated several more times until 1928 when the monks who then owned the cemetery built a cemented stone cairn above the site. The cairn and site can still be visited on the Monastery grounds. Pierce's Fight was followed by the burning of Providence three days later, and then the capture and execution of Canonchet, the chief sachem of the Narragansetts. The war was winding down even at the time that Pierce's party was destroyed, and in August, King Philip himself was killed. One of the most disastrous military excursions of the King Phillip's War was called Pierce's Fight, in which most of the colonial soldiers of Pierce's command were killed. A group of nine of the soldiers escaped the original Indian ambush, but were separately later captured, tortured, and killed. Benjamin Bucklin was one of the nine who were killed. The nine bodies were found a day later by a military burial mission working on burying the remains of those killed the day before. The remains were buried on the spot on which they were found, a rise of land in a swampy area. Because of the gruesome nature of the torture indicated by the state of the bodies found by the burial mission, the site became known locally as the Nine Men's Misery.